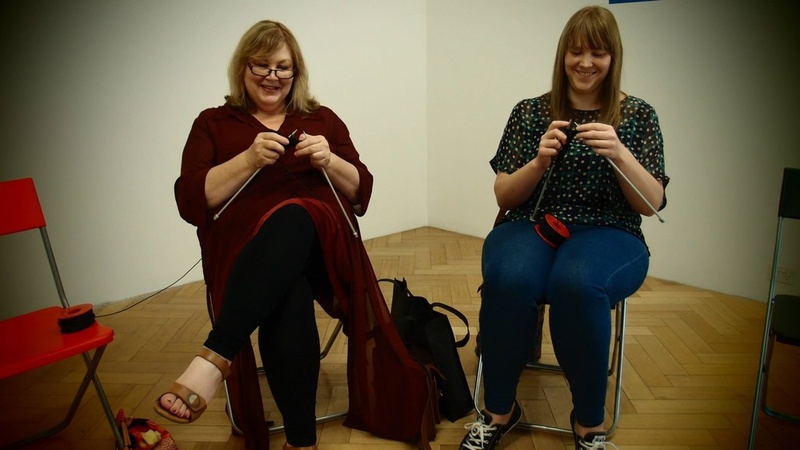 Just has created a series of public knitting projects with participants locally and overseas. The first occurred during a residency at KREMS AIR in Krems, Austria in 2011. Krems neighbours the town of Willendorf, where The Venus of Willendorf, a famous, tiny Paleolithic sculpture of a woman from 25,000 B.C. was found. Recently, archaeologists have argued that the Venus of Willendorf may have been a self portrait of a woman, or textile artist, rather than iconic symbol of female fertility. Inspired by the potential to rethink the Venus as a unique person casting her own presence in the world, Just created the exhibition Venus Was Her Name, which included a series of collages, knitted sculptures and ceramic objects. These pieces continued Just’s questioning of frameworks that focus on women as biological or sexual symbols. A central part of the exhibition was a three dimensional sculpture of the word 'VENUS' out of cardboard, with archaic knitting symbols taking the place of letters. The ‘skin’ for this VENUS was collectively knitted with more than seventy women from across Austria. 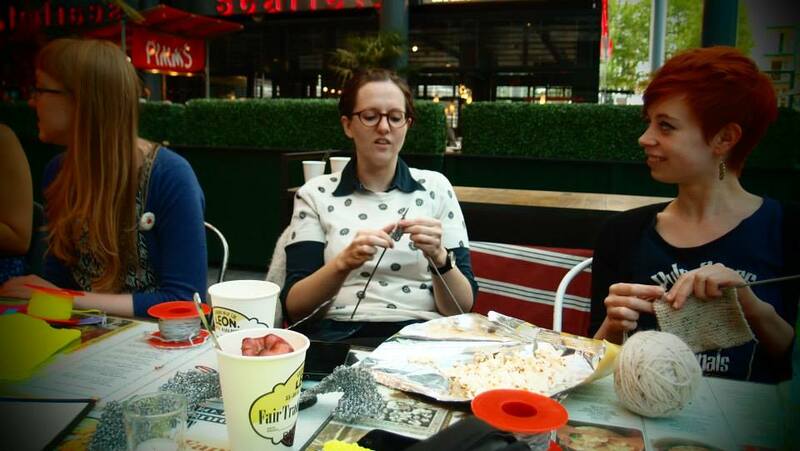 Public knitting events invited participants to KNIT FOR VENUS. Each knitter used a thick brown twine reminiscent of fibres used in early forms of armor and could knit in any stitch or tension they liked. The resulting sculpture recast the Venus of Willendorf as text rather than ‘body.’ Bearing the unique stitches of many women, and a few men, the knitted VENUS resonates with the interplay between communal activity and individual expression. In 2013 and 2014 Just created two banner projects entitled KNIT HOPE and KNIT SAFE. KNIT HOPE was a UK based public art project developed as part of a British Council Realise Your Dream Award and with assistance from the Australia Council for the Arts. Just travelled to Colchester, Leeds and London and invited individuals and communities to publicly join her in knitting a night-reflective fluorescent yellow banner that spells the word HOPE in silver block letters. Later, various HOPE walks were taken in public at night with it. Bearing the artist’s daughter’s name, the resulting HOPE Banner manifests the artist’s wish for a brighter future for women broadly and for her own child specifically. Materially and conceptually, the banner entwines dualities of male and female, public and private, individual and collective. The uniquely patterned individual pieces refer to the work of many hands, joined together to form a seamless whole. The durability of the builder’s line and the high-vis reflective material, which is worn by construction workers, police and cyclists, imbues the banner with a level of visibility and authority. 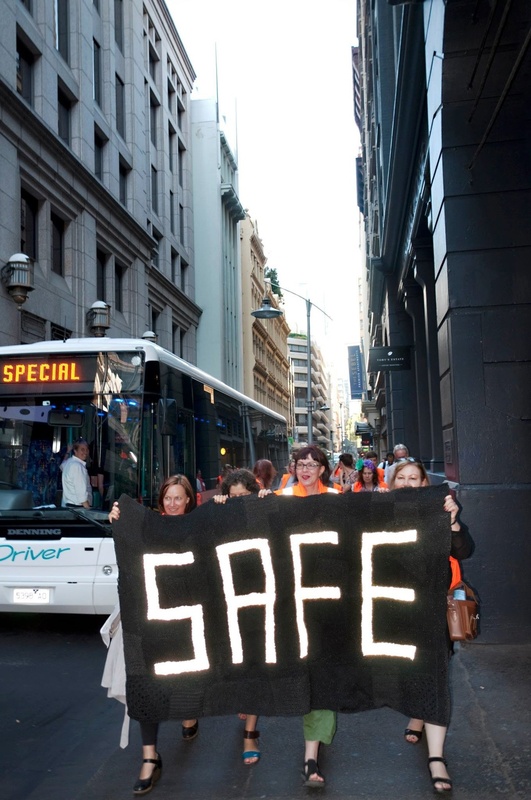 On return from the UK in early 2014 and with funds from the City of Melbourne, Just undertook the KNIT SAFE Project in Melbourne. It involved the communal crafting of a sister banner, a night reflective black and silver ‘blanket’ that spells SAFE. 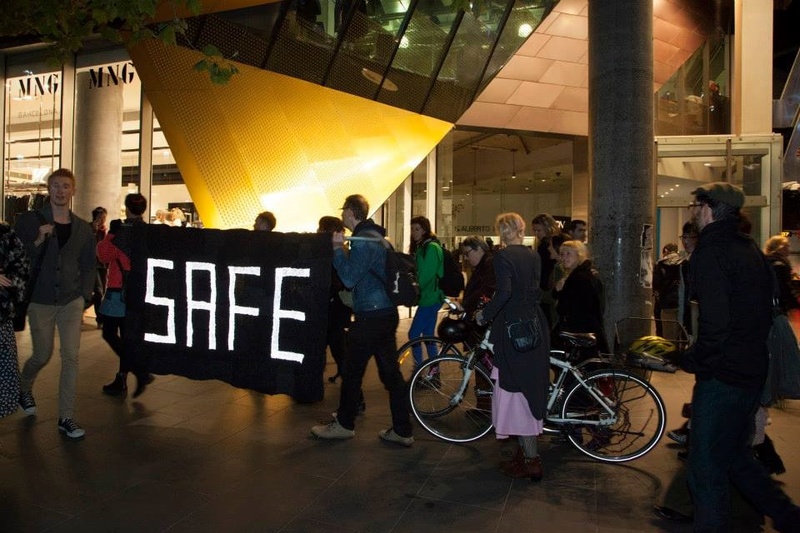 The more sombre SAFE Banner operates as a shield or soft monument constructed in the shadow of recent high profile violent deaths of women in Melbourne including Jill Meagher, Tracey Connelly and Fiona Warzywoda. The HOPE SAFE book documents the projects in their entirety and features an in-depth essay by art critic and historian Dr Juliette Peers. Both banners, and photos documenting the walk were exhibited in HOPE & SAFE at Daine Singer in October. Big Knitted Welcome Mat was a project led by Kate Just in the City of Greater Dandenong during the Cultural Threads Festival in August 2014. A book documenting the project is available here. Over one month, Just invited community members, individuals and school groups to publicly knit and crochet squares with her in a vacant window fronted space called The Shard in Dandenong's civic centre. The pieces were assembled into an over-sized, textured red and white mat that spells WELCOME in block letters. A welcome mat usually reflects the crossing of a threshold between an exterior space and the private, interior space of the home. It is a signal to enter, to join, to share and to belong. Big Knitted Welcome Mat sought to reflect with the inclusive, multicultural fabric of the City of Greater Dandenong, which has been a Refugee Welcome Zone since 2002. In June 2014, in reaction to the harsher federal approach to refugees and asylum seekers, the council signed a new declaration reinforcing the city’s welcome stance. Big Knitted Welcome Mat attracted local participants from many different countries including Singapore, Russia, Italy, Chile, Sri Lanka, India, Finland, the USA, the UK and Malta. While making Big Knitted Welcome Mat, participants contemplated the importance of welcoming and enacted the potential for interpersonal and cross cultural connection, through craft.